Choosing the calming roar of ocean waves over the disquieting din of polarized political debate. 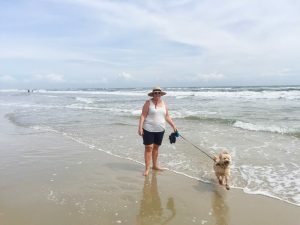 Betty & Charlie enjoy a late afternoon walk along the Cape Hatteras National Seashore. Before Betty & I set out on our overlandish odyssey, I confess to being something of a news junky. 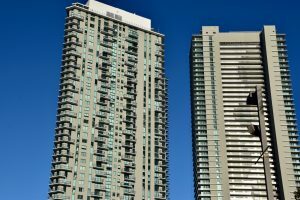 We were daily subscribers to the Winnipeg Free Press, with comparatively well-written local, provincial, national, and international journalism adding detailed commentary to the news gleaned nightly from CBC and CTV national and local programs. As an engaged citizen, I always felt it was my responsibility to remain current on local and international issues. But now, might I venture to say that ignorance is bliss? The little bumps on logs along the roadside leading to the coast are little turtles! They take shelter in their shells for protection. On the other hand, those more important events are usually prioritized into “If it bleeds, it leads” formats. Terrorism, wars, mass shootings, earthquakes, hurricanes and tornados resulting in death and destruction all create a context for understanding the world around us. But as they invade our living rooms on a daily basis, do they skew our perception of our level of safety and our need to defend ourselves against unknown adversaries? When we remain in a terrorized state, the terrorists have won. Ok, I have to admit that, from time to time, I check out the news on-line; enjoy picking up a local newspaper; and make sure that our bathroom magazine rack has the latest edition of Time magazine. (I haven’t seen a Maclean’s magazine since leaving Canada. lol) But for the most part we are cut off from the trials and tribulations of the world around us. 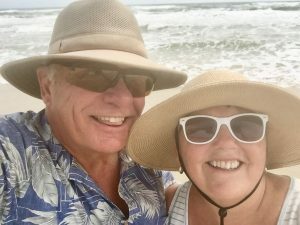 Graham & Betty attempt a selfie along the Cape Hatteras National Seashore. Over the hump, to see the vast undulating world beyond! 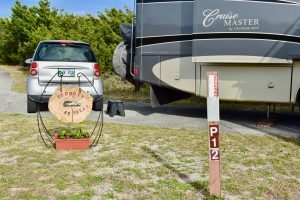 The Reddoch Retreat sign posted at Site P12, Frisco Campground on the Outer Banks. Love you to the beach & back! 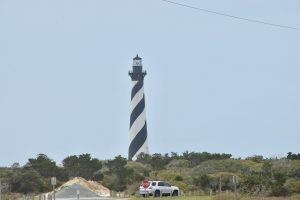 Can’t have a post about Cape Hatteras without a pic of the famous lighthouse! 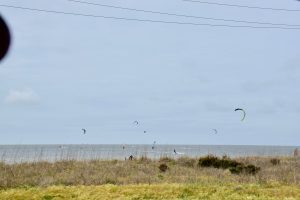 Kite surfing is a popular pastime in Pamlico Sound. 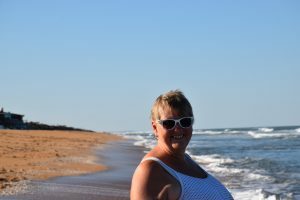 Betty, Charlie (and Graham) enjoy their happy place at Cape Hatteras National Seashore, or the Outer Banks (OBX) as the locals call it. 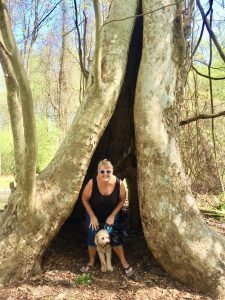 Last of the pics that wouldn’t previously load: Some of the trees in Pettigrew State Park were big enough for Betty & Charlie to stand inside. 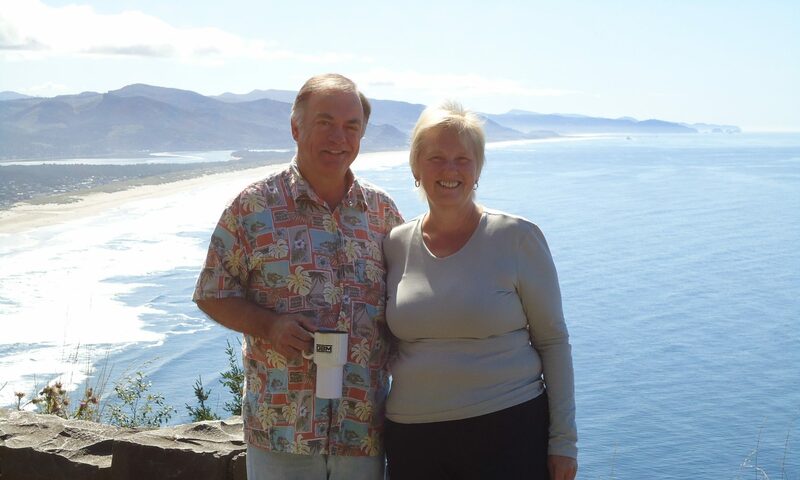 There are certain reference points in our travels north, south, east and west, that mark our journey across the continent – like dipping a toe in the Atlantic, and then the Pacific. 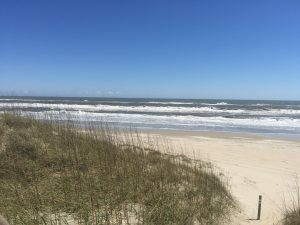 Myrtle Beach State Park was a favourite stopping point in childhood camping trips up and down the U.S. eastern seaboard, and comes to mind whenever I think of “must visit” east coast locations. 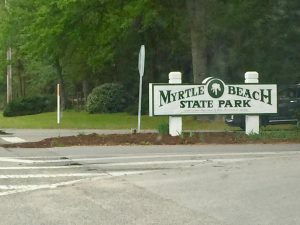 Our site (#155) at Myrtle Beach State Park. The attractive road through the forest to the campground. Grand Strand beach. 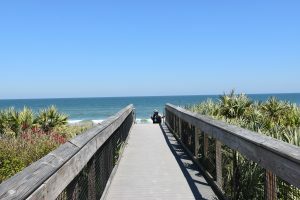 Many hotels have been added to the Atlantic coastline at Myrtle Beach, but it is nice to see the thick maritime vegetation, with numerous hiking trails, picnic areas, and bike paths within the park. 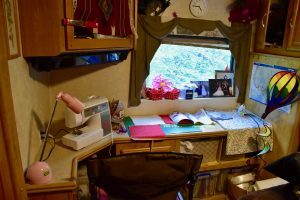 Betty’s new sewing centre – amazing creativity at work here! Heading to the beach after our drive from Sesquicentennial State Park in Columbia. 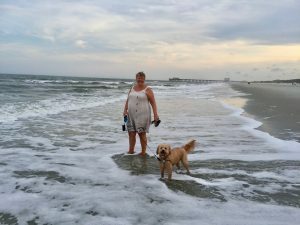 Betty & Charlie enjoy a late day break at Myrtle Beach. 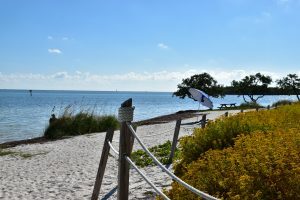 The park’s fishing pier is in the background. 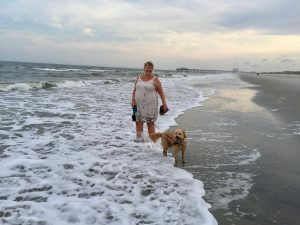 Betty & Charlie catch a wave, or the wave catches them… at Myrtle Beach State Park. 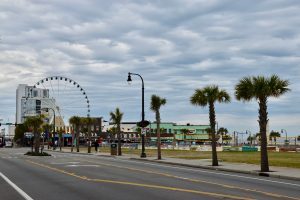 A distant view of the older section of downtown Myrtle Beach, much as I remember it (although I think the second building on the right was an auction house back in the day). This pic has nothing to do with Myrtle Beach, but our dear son Andrew seems to have fixed the problem with portrait pics not rotating to vertical. Yea! Thanks Andrew! 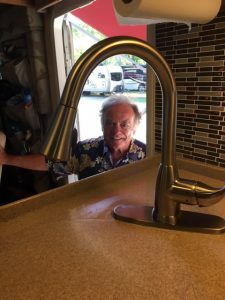 (It’s a pic of the new kitchen faucet I recently installed.) Cheers! 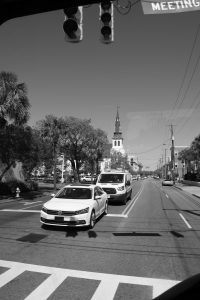 In the background is the steeple of Emanuel African Methodist Episcopal Church in Charleston, SC where a white supremacist killed 9 African-Americans in 2015 – a huge tragedy for humanity. In documenting our travels, it has become my practice to review our pictures each week and wait for them to tell their story. The message I scribe is most often a joyous one, as Betty & I are very much enjoying what we are seeing on our overlandish adventure. At some point this week – most likely while returning my camera to its bag – the settings unintentionally changed from colour (or color in U.S.A.) to black & white. 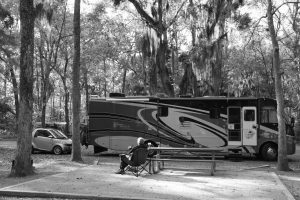 We took historic city tours through Savannah, Georgia and Charleston, South Carolina, and are now camped at Sesquicentennial State Park in Columbia, South Carolina, a park I last visited with my parents over 50 years ago. While we are keenly aware of the history of difficult race relations in this part of America, Betty & I have experienced nothing but the warmest of southern hospitality from blacks and whites during this visit. This blog post highlights our brief time here. 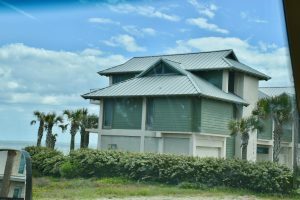 A beachfront home on Amelia Island, as seen from our motorhome on A1A. 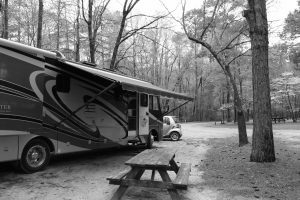 Our site (#8) at Crooked River State Park, Georgia. 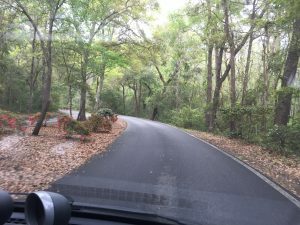 A short drive up the coast from Crooked River took us to Skidaway Island State Park on the outskirts of Savannah. 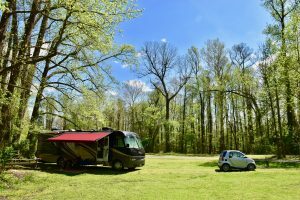 A popular park, we were unable to book a single site for two nights, but made the quick trip from site #64 on our first night to site #1 for our second. 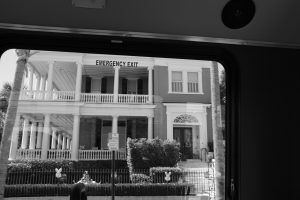 As has been our practice in many new cities, we took an enjoyable trolley tour around Savannah, whetting our appetite to see more of this attractive, historic city on a future occasion. 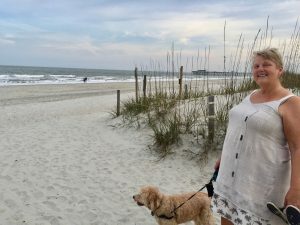 Bet has Georgia on her mind – the state and our granddaughter! 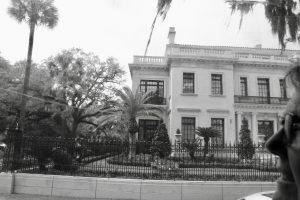 An elegant private home in historic Savannah. 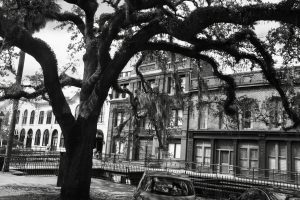 One of 22 squares in downtown Savannah. The city was originally designed with 24 public squares, and all but 2 still exist. Betty & I enjoyed strolling through Savannah’s City Market. 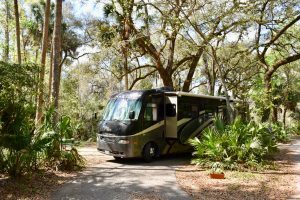 Site #1 at Skidaway Island State Park. Spanish moss is a common element in the deep south. Unfortunately, the grey moss is not highlighted in a black & white photo. 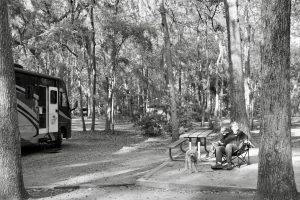 Betty & Charlie relax under the spanish moss covered trees at Site #1. 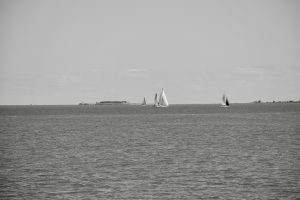 Viewed across the Charleston harbor, Fort Sumter was where America’s Civil War began. 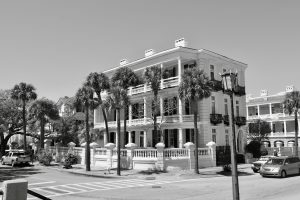 In downtown Charleston, many of the older homes are graced with large, multi-level verandas, called piazzas. 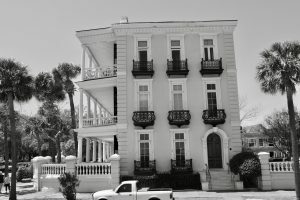 A side view of this elegant old home in Charleston, SC. 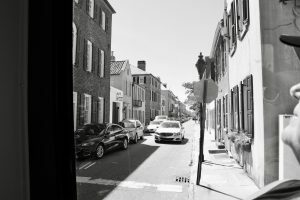 One of Charleston’s narrow side streets. This one’s made of cobblestones which had been used as ballast on incoming ships from foreign countries, including Canada. The street leads to the harbour.. 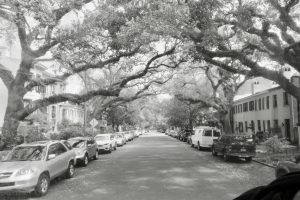 Majestic live oaks arch over the streets in Charleston, SC. 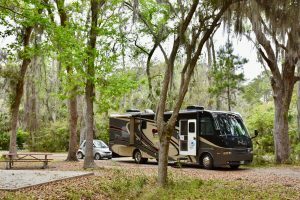 Our next stop was Charleston, South Carolina, where we found a full service site (#P3) at Oak Plantation Campground. Since the site was unavailable for a second night, we moved to a local Walmart where we stocked up on groceries, unhooked the Smart, and headed for another guided tour of this beautiful old city. 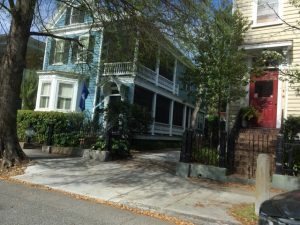 Taken with Bet’s phone, this picture shows Charleston’s unique style of “single house” with a side door leading to an outside porch. 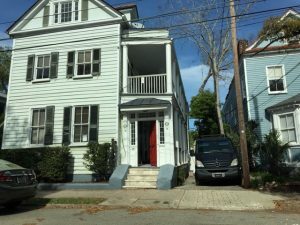 In Charleston, the double covered porches are called piazzas, and the door only appears to lead into the home. 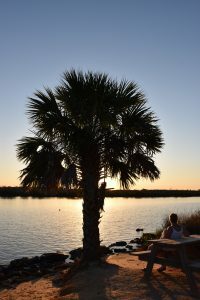 After dinner at downtown Charleston’s Sticky Fingers, we decided to hook back up at Walmart and head out to an I26 rest area near Orangeburg, SC. 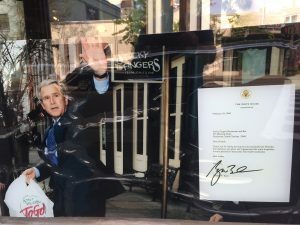 President George W. was also a fan of this Charleston restaurant, which serves delicious ribs & wings with a variety of tasty sauces available on each table. Our current site (#29) at Sesquicentennial State Park in Columbia, SC. Our last black & white pic, thankfully! a parking base. The campground still has work to be done to level quite a number of sites, whose uneven elevation is not apparent on campground maps. But it is still a nice large park on the outskirts of Columbia, the capital city of South Carolina. Gavin gets in on the sticker fun, adding South Carolina to our map. 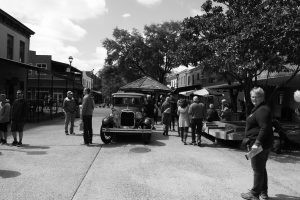 During our time in America’s deep south – with its historic plantations and slave cabins – we have purposely sought out encounters with its inhabitants. It is difficult to capture the complexities and nuances in a brief post, especially one labelled Black & White. But permit me to relate a couple of very brief stories (each of which could take a separate post…). 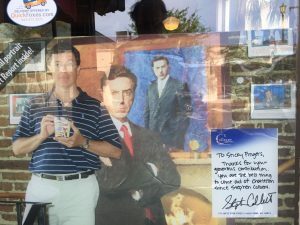 The Haircut: I have always been cautious about who cuts my hair, but purposely chose a barber shop with four black barbers and a shop full of African-American customers. When my turn came for a cut, I had some difficulty describing a “normal” haircut, when no one in the room had hair like mine. Lol. It was my first haircut without scissors being used – just razors – and it took place with the chair turned away from the mirror on the wall, so I had to put my trust in the barber. Would I leave with the logo of a popular sports team carved on the back of my head? Well, due to hair loss in that area, the possibility was significantly lessened, and I don’t have the tight curls that make that job easier. Lol. In any event, I was warmly welcomed by everyone in the shop, with handshakes and heartfelt thanks for coming from each of the barbers as I left. BTW, I’m happy with the haircut, too! 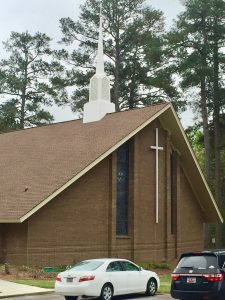 Windsor United Methodist church in the suburbs of Columbia, SC. 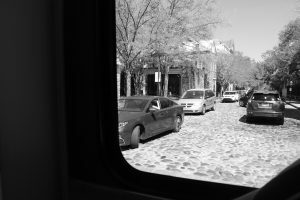 With my camera settings adjusted, the pic still shows the cars in black & white. lol. 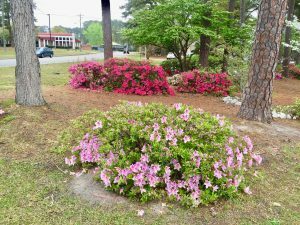 The fiery preacher: For church on Sunday, Betty & I chose the nearest church to our campground, which turned out to be Windsor United Methodist Church with a mainly white congregation, but a lively black female minister. Rev. Leatha Brown’s message on forgiveness – both the need to extend and receive forgiveness – seemed most impactful personally and in a part of America where black & white have struggled with reconciliation. May we pray that we can all turn the lenses through which we view the world from black & white to see the richness of full color around us? The flowers on the church lawn were in vibrant colours. Glad to have the color in our lives! 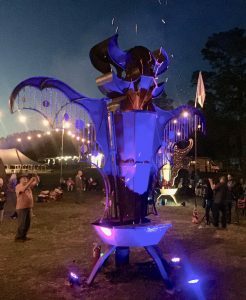 Our site (#48) at the RVillage rally in Spirit of the Suwannee Music Park, Live Oak, Florida. 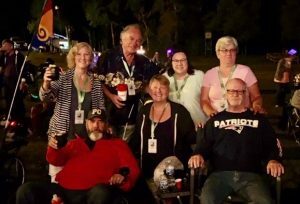 Last week, Betty & I joined 700 other RVers at Spirit of the Suwannee Music Park in Live Oak Florida for RVillage’s Rally 2.0. 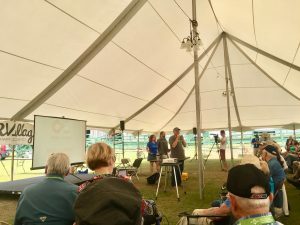 We had previously attended a small Good Sam rally in our home province of Manitoba, and a regional FMCA rally near Houston, Texas, and very much enjoyed both events. 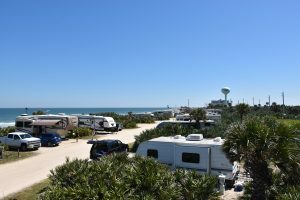 Being relatively new to the RVillage network, and never having attended a large RV gathering, we were somewhat apprehensive as we made the short trip westward from our last campsite at St. Augustine, Florida. Long story short: We had a great time! RVillage founder, Curtis Coleman, introduces Chris Dunphy & Cherie Ve Ard of Technomadia. As a fairly private person, I have posted almost nothing on Facebook, Instagram, Twitter, or any of the other social networks (if that is what they are called…). So prior to the rally, our RVillage profile provided a bare minimum of information about Betty & me. RVillage is a relatively new social network, conceived just a few years ago by Curtis Coleman, founder and current CEO. At a session called “RVillage for Beginners”, Curtis assuaged our privacy concerns and reviewed a whole range of filters that can be turned on or off on the platform, customizing the information shared about us and the information desired from others. 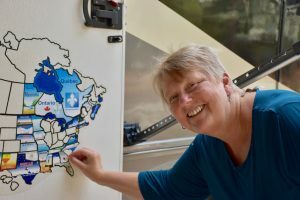 Bottom line, the platform is a very useful tool for connecting with, and staying connected to others who share our passion for RVing. 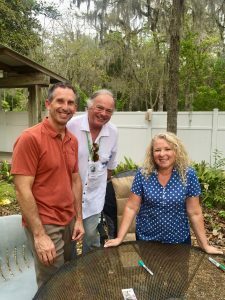 Marc & Julie Bennett discuss Living The RV Life. Graham meets Marc and Julie at their book signing. respected YouTube personalities who have a wealth of experience keeping in touch while on the road. 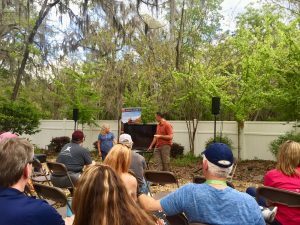 Also most inspiring was a presentation by Marc and Julie Bennett of RVLove, telling their story of “Living the RV Life: Your Ultimate Guide To Life On The Road”– their recently published book. Some of our new friends gathered at the firebirds. Creds to Indiana Steve for the great pic. told with such a wide range of wonderful accents! I guess, in the end, that’s what brought us all together and will keep us connected in future – our wanderlust to see all that we can in the time given to us to travel this earth. 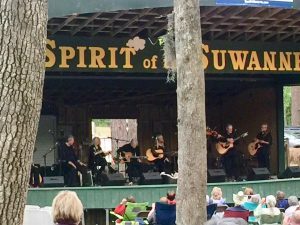 The New Christy Minstrels shared their uplifting songs at the Spirit of the Suwannee. 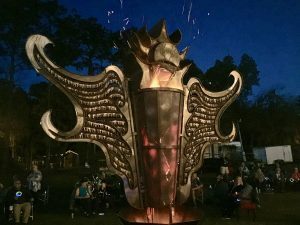 The Suwannee Music Park reminded Betty & me of the site and vibe of the annual Winnipeg Folk Festival, and it was fitting to finish our last night together listening to the harmonies of the New Christy Minstrels (with former member Curtis Coleman), and enjoying the amazing metal “Firebird” sculptures that were set ablaze each night of the gathering. 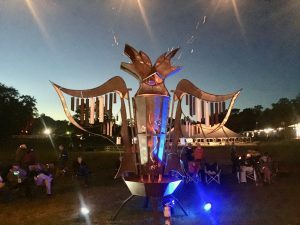 A firebird lights up the night. Wasn’t that a party? Well yes it was! RVillage Rally 2.0 Spirit Of The Road set our spirits soaring and inspired us to continue adventures on our overlandish odyssey, but now better connected than ever! This firebird was adorned with keys that glowed as the fire burned. 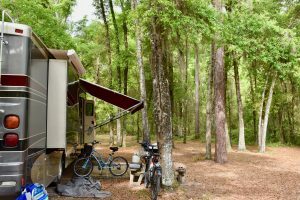 Our well-treed site(#22) at Juniper Springs in Ocala National Forest. 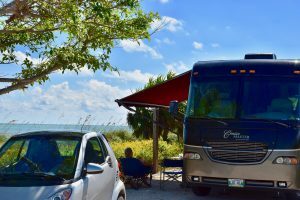 If Betty & I were to park our motorhome for an extended period of time, we would set it and forget it, like the commercial says. While we intend to slow down our travels soon, this outstanding overlandish odyssey is constantly taking us through new adventures that require regular adjustments. Today’s post highlights some of the settings required in each new location. 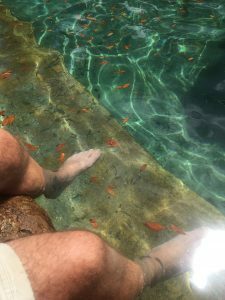 Dangling our feet among the small fish in the crystal clear waters of Juniper Springs. 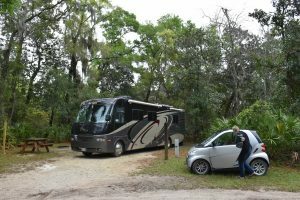 It’s not quite on the level of an airline pilot, but prior to take-off, and after landing our home-on-wheels at a new campground, we need to work through our check lists. Of course, as Quality Officer for Women’s Health, Betty promoted safe surgery checklists in the hospitals where she worked, so this comes second nature to her. In the camp spot, we need to follow different procedures based on the availability of water, electricity and a sewer connection; whether it is a pull-through or back-in site; and whether it is level, shaded, or congested, to name a few criteria. 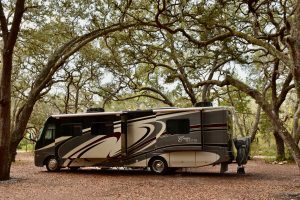 Is it easier to set up in a full service site, or a boondocking location? One is not necessarily more difficult than the other – just different. Of course, when I’m talking about hardship here, camping in our motorhome is definitely not the same as in a tent. The hard part is remembering which buttons to push at the correct times. Lol. 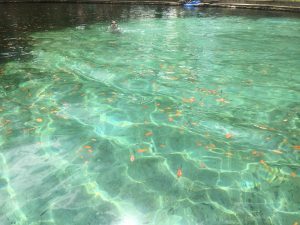 This picture of the natural springs pool at Juniper Springs is not adjusted. The water sparkles all the way to the bottom. 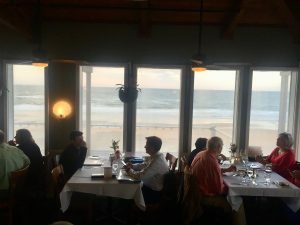 The Atlantic Ocean view from our table at St. Augustine’s The Reef restaurant. and have switched to LED lighting, which is still turned off if not in use. Electricity from our solar panels/ batteries also needs to be monitored more closely than 50 amp shore power. We do have longer showers if we are hooked up to a water source, but then have to remember to flush less and conserve water more when we are boondocking. In most locations our generator and solar can provide power to meet our needs almost indefinitely, but our black and grey tanks are only good for a week before we have to find a place to dump them. 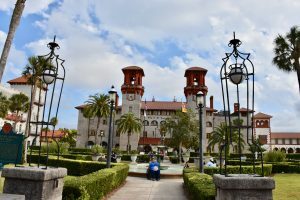 St. Augustine’s Lightner Museum was built by Henry Flagler as the Alcazar Hotel. The city is the oldest in America. 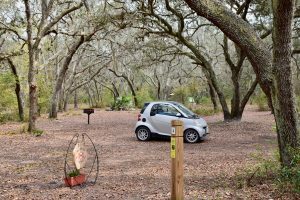 Betty prepares our car to leave site #20 at Faver-Dykes State Park, just south of St. Augustine, Florida. RVillage rally. By capturing each location in words and pictures, Betty & I are better able to remember the settings for each of these beautiful stops. Hope you can remember where you are at with whatever you are doing also! 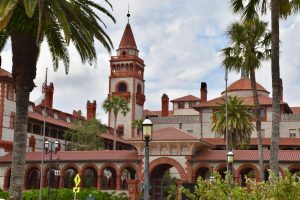 St. Augustine’s Flagler College was once the high end Hotel Ponce De Leon, built by Henry Flagler. It was the first to have running water and electricity in every room, installed by Thomas Edison. A beautiful setting. 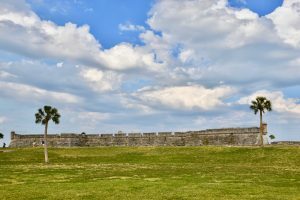 In a prominent St. Augustine setting, the Castillo de San Marcos, completed in 1695, replaced nine wooden forts that burnt down. It is the oldest masonry fort in the United States. 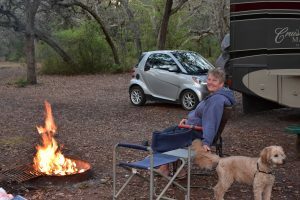 Betty, Charlie & I enjoyed a campfire before leaving our site (#4) at Tiger Bay State Forest. Throughout our adventures, Betty & I have tried to drive a fine balance between planning our itinerary, and being spontaneous. Both approaches have advantages and disadvantages. 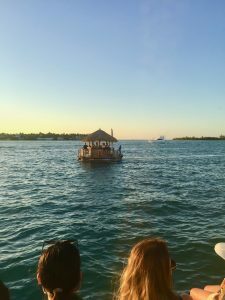 With rigid, detailed planning of days and stays, we can miss out on unexpected surprises that call us to sidetrack, learn about and experience new, previously unknown destinations. 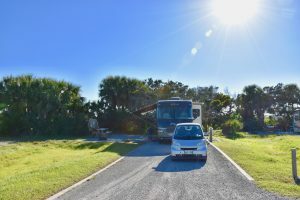 But by leaving everything to chance we find many of the nicest campsites and campgrounds on our preferred route were booked many months in advance and not available to us. It’s not easy to maintain that balance, but this week we got lucky! 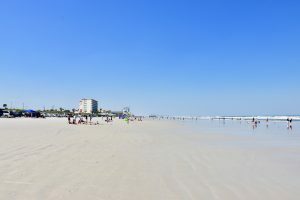 The wide, flat beach (at low tide) at Daytona Beach continues to be a popular spot to drive, park, and play. 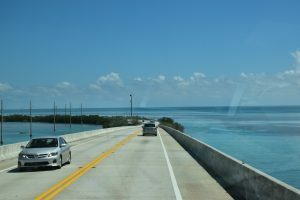 Heading slowly northward from the Florida Keys, up the eastern seaboard of the U.S.A., we made few advance bookings. 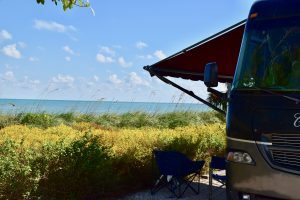 Before leaving Winnipeg in December, Betty & I had snagged a few nights at Manatee Hammock campground in Titusville, in order to facilitate our visit to the Kennedy Space Center. 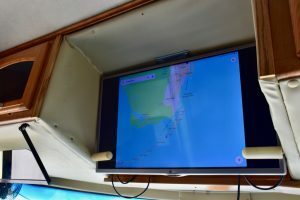 Otherwise, we were open to exploring the Atlantic coast, with fingers crossed that we would find decent accommodations. 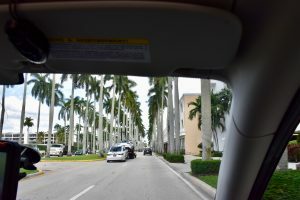 The three campgrounds where we stayed in the Fort Lauderdale/Palm Beach area were great choices, and we would have enjoyed more time in each. 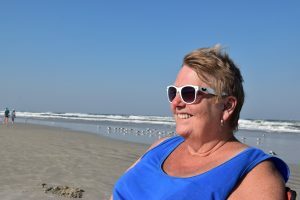 Betty catches some rays at Daytona Beach this week. 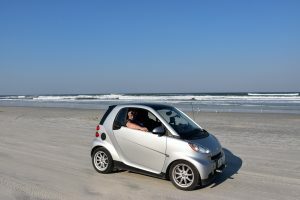 It was fun to drive the Smart for miles down Daytona Beach. 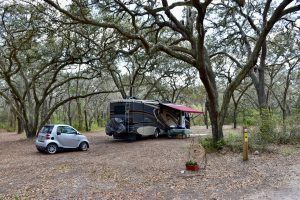 Our site last night (#64) at Gamble Rogers Memorial State Recreation Area. 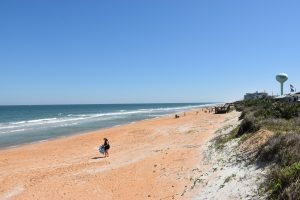 We spent the day yesterday at Flagler Beach. 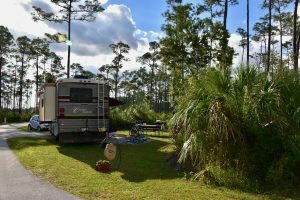 advance, but Betty & I got lucky with site 64 for last night in the riverside campground, and had a great day visiting the beach from there. 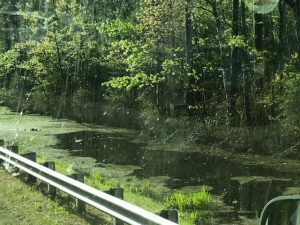 We had nothing booked for tonight, and hoped to find a spot somewhere in Ocala National Forest, about an hour away. 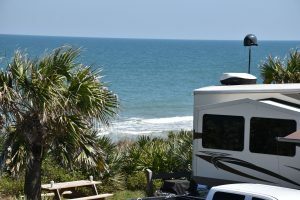 The view of the Atlantic Ocean from our current site (#2) at Gamble Rogers. and their site would be available. “Would we like it?” Well, the pictures attached to this post don’t do justice to how beautiful this spot is! 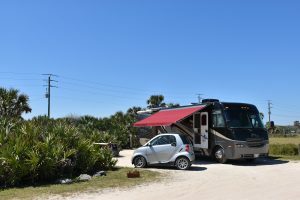 The sand in each site is carefully raked by campground hosts, and the sites are complete with 50 amp electrical service and water. Of course, the big pond is also within sight of our site. So this week Betty & I got lucky. Saying more than that would be tmi for our kids and grandkids, so we’ll just leave it there! 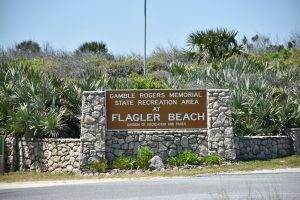 There are only 34 sites on the beach side of Gamble Rogers Memorial State Recreation Area. Today’s beach side site (#2) came with 50 amp elec. service and water for $28.. Bet takes the boardwalk over the dunes to the beach. Bet finds a spot on the beach today. Lucky us! marvel at the heavens above. 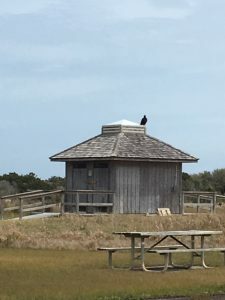 We have been thrilled to sit in the warm sun under bright blue skies, and to watch the moon and countless stars at night. 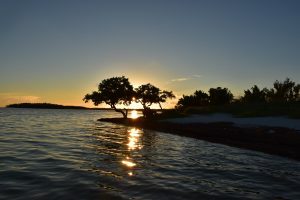 Prior posts have captured the transition from day to night, as the sun dips over the horizon. It’s a fabulous perspective on the world around us. 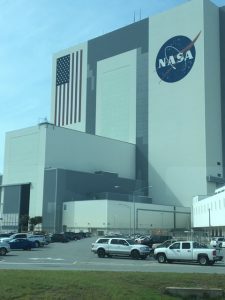 Ground Control (maybe called Launch Control) is the low windowed building on the left, next to the Vehicle Assembly Building where a rocket is under construction. 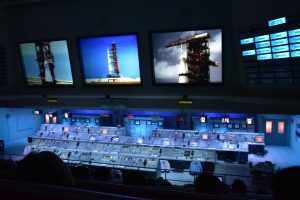 Once the rocket is launched, responsibility transfers to Mission Control in Houston, Texas. 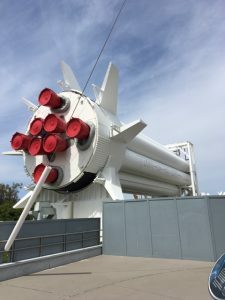 The original Launch Control – not a mock-up. Bet wonders what Bruce Cockburn would do if he had a rocket launcher. Bet joins a rocket man in a space capsule. 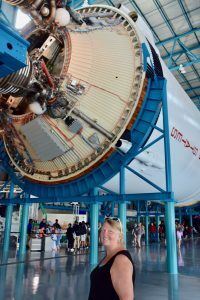 Bet stands next to a part of the Apollo/Saturn V space craft. 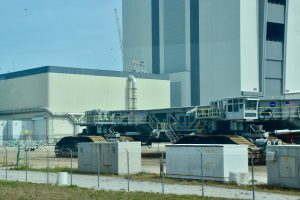 It takes an oversized flatbed to move those space craft to the launch site, 3 miles away. 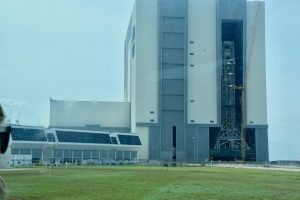 A view of the launch pad, from the Apollo/Saturn V centre. Same view, zoomed in a little. 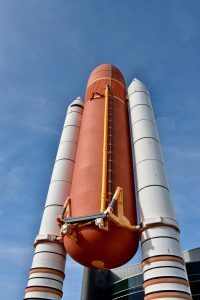 A Delta IV rocket was scheduled to launch the day after our visit. 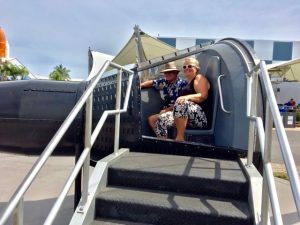 VIP launch viewing stands at Kennedy Space Center. 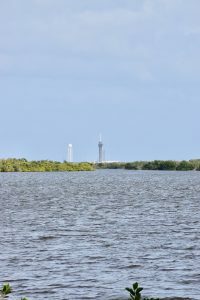 Launches can also be seen from Titusville & the Manatee Hammock campground, where we stayed. 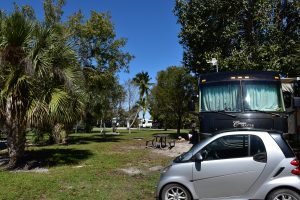 Our site (#76) at Brevard County’s Manatee Hammock campground in Titusville, Florida. 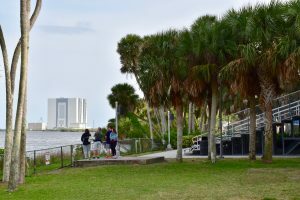 In the background is the gathering spot at water’s edge, for watching missile launches. Is that Elton John’s Rocketman? 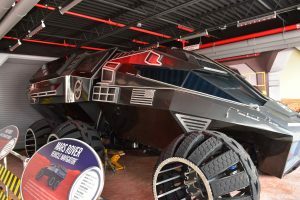 This baby will out-maneuver the Hummer in your garage any day! 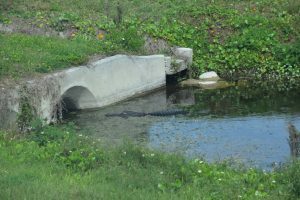 The alligator in this ditch adds another level of security to the Kennedy Space Center. 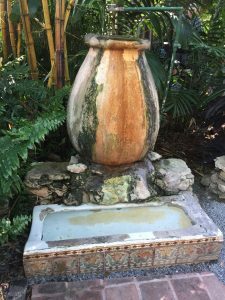 The pics on this post capture a little of what we saw last week. 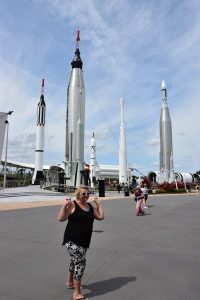 Perfectionist tendencies would require me to accurately caption what you are seeing, but that would require a little more research, as I’m still a bit vague about the up close difference in appearance between a rocket, a space ship and a missile, all of which we saw. Lol. Hope you can appreciate your perspective on planet earth, wherever you find yourself this week! 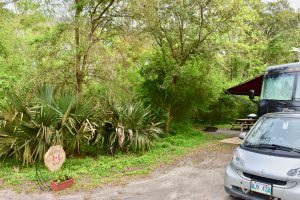 Our current campsite is nestled in the trees at Tiger Bay State Forest, a short drive west of Daytona Beach. Our site (#4) is one of only six in the Bennett Field Campground. Each site is approx. an acre in size! Booked & paid for on-line through “Reserve America”, our beautiful, peaceful site included a good quality picnic table, fire pit, and bbq, for approx. $9./night! 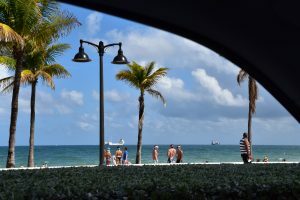 The beach at Fort Lauderdale, across from the motel where we previously stayed. 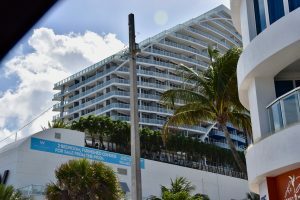 A condo across from the Fort Lauderdale beach is available for only $900,000. & up! 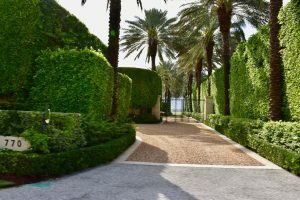 This Palm Beach home has its gates open: Welcome! 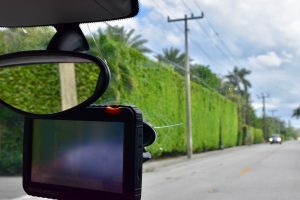 A number of hedges along A1A were at least 2 stories high! 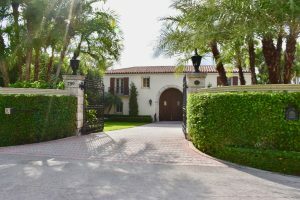 An attractive hedge arches over the open gate of this Palm Beach home. Our campsite (#20) at T.Y. 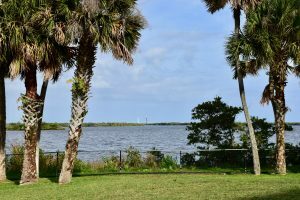 Park, Broward County, Florida, centrally located near Fort Lauderdale. 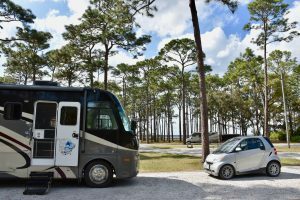 After exploring the series of small islands that make up the extreme south east corner of the U.S.A., Betty & I have finally turned our home-on-wheels to face the north again. 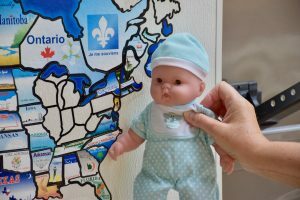 The journey north to Winnipeg is expected to take at least two more months, with the actual date subject to spring forecasts for Manitoba. Call us when the snow is all gone… Lol. 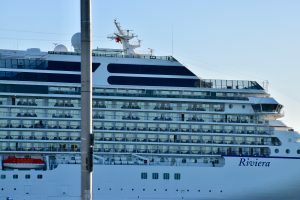 The back of a fully loaded cruise ship, ready to set sail from Miami. Let the adventure begin! 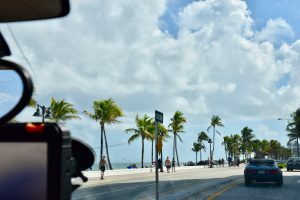 As we bake in southern Florida’s tropical weather, it seems strange to watch the dire predictions and reports of extreme weather in states and provinces to the north. 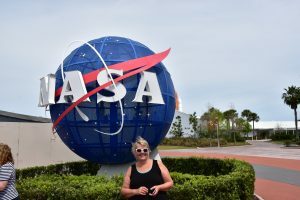 Next week we will visit Cape Canaveral and learn about space exploration, but already it feels like we are in a different world! 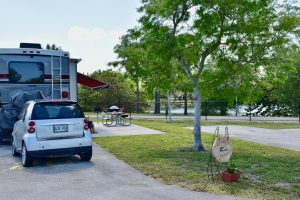 Our large, full service site (A1) at Broward County’s Markham Park Campground, cost us $40./night. 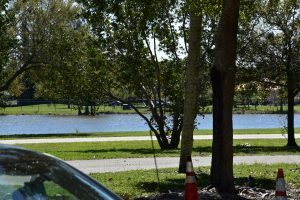 Our Markham Park campsite, just west of Fort Lauderdale, had a view of the local canal. Betty & I have been dividing our time between three campsites this week. 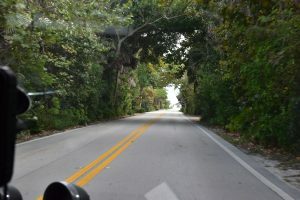 Using each as a base camp, we have been driving up and down the coast, mainly on the small coastal road known as A1A. 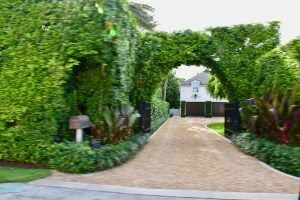 The entrances to most of the homes along AIA were heavily landscaped, blocking our view. Surprise! Surprise! from Palm Beach to Southern Blvd. 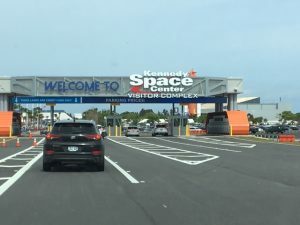 We were surprised and disappointed that the President didn’t invite us over for lunch, but I guess the police who spoke to us at one of the check-points didn’t pass on our travel schedule. Maybe when we get up to Washington. Lol. 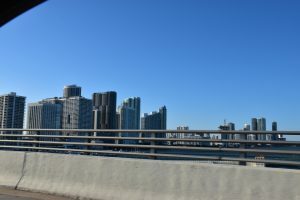 Approaching the Miami skyline, as we cross the bridge from Miami Beach. 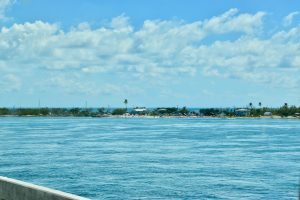 Betty captured one the smaller boats on the intracoastal waterway near Miami Beach. 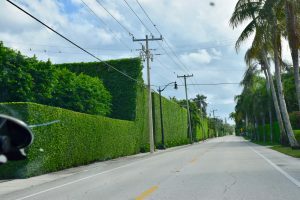 the art deco buildings of Miami Beach, and the yacht clubs, golf courses, private homes, and exotic condos from Fort Lauderdale to Boca Raton, to Delray Beach, Boynton Beach, Palm Beach, and all the other beaches in between. 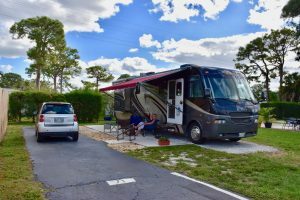 Our full service site at Palm Beach Traveler Park (site #71) includes a flat gravel parking pad, a concrete patio, and an asphalt driveway. 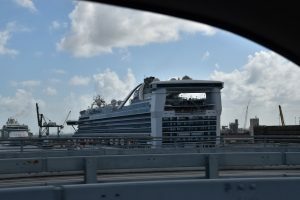 We drove past another fully loaded cruise ship at Fort Lauderdale. It appears there can be many tall tales told along the Gold Coast. Cheers! 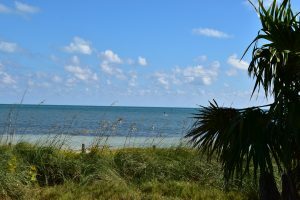 The Atlantic Ocean, as seen from our site (#19) at Curry Hammock State Park. 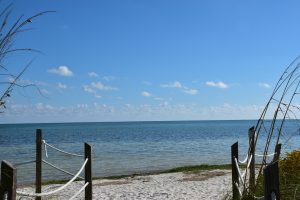 The campsites at Bahia Honda State Park, as viewed across the glistening turquoise waters. 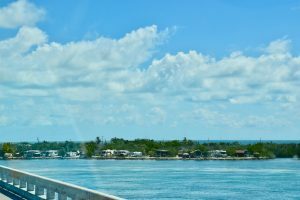 One can see why the campground at Bahia Honda State Park is popular. 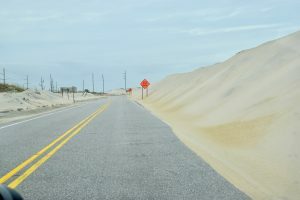 contained at least one palm, a picnic table, fire pit, and sandy beach. Nirvana! 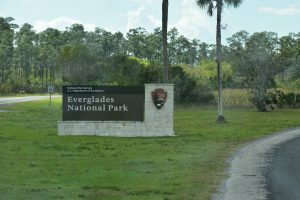 Our goal was to spend two weeks in each park (the maximum allowed), moving up and down the Keys based on availability. This turned out to be wishful thinking! 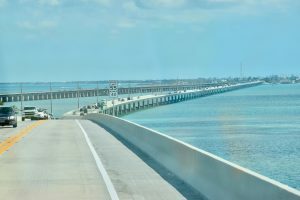 Crossing one of the 42 bridges that link the Keys to Florida’s mainland. With my polarized sunglasses, the water appeared an even more vibrant turquoise than in these pics. reserve. If I clicked 1 second past the hour, the site was already booked by someone else. This happened nearly every day for 3 – 4 weeks, until I realized that I would never have the speedy connection required to beat the competition. 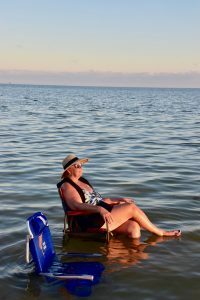 From time to time I checked back, and one day I found one night available at Curry Hammock State Park near Marathon: March 1, 2019. So our Keys adventure was built around that one booking. 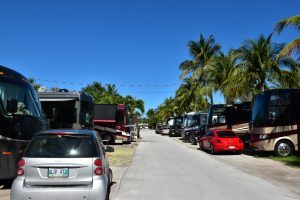 Packed into the crowded, popular Boyd’s Campground in Key West. Our site was #197. 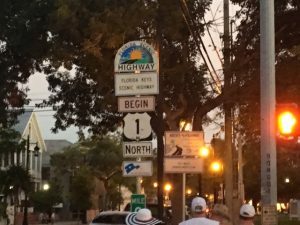 Most of Highway 1 is one lane each way from Key Largo to Key West. 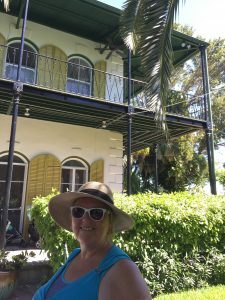 We began our visit to Key West with the mandatory pilgrimage to the home of Ernest Hemingway. 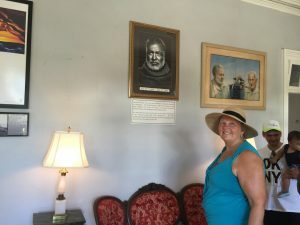 Betty checks out one of the many Hemingway portraits in his living room. 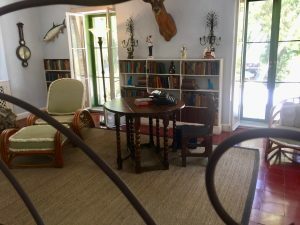 Apparently as he left it, Hemingway’s writing studio is in an adjacent carriage house on the beautiful Key West property. 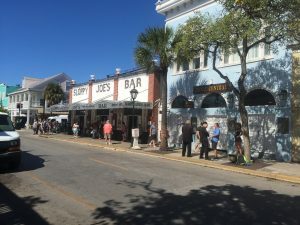 Sloppy Joe’s Bar, on popular Duval Street in Key West, was the source of Hemingway’s urinal, and one of his many hang-outs. 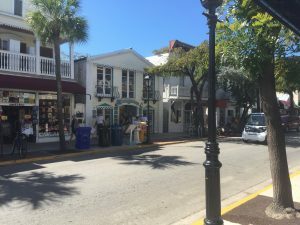 Lots of day and night life can be found along Duval Street in Key West. 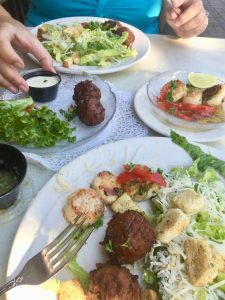 We chose Duffy’s Steak & Lobster restaurant for some tasty seafood & filet minion. 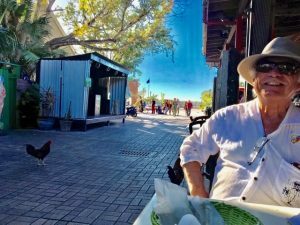 For another dinner, Betty & I dined al fresco with the roosters at El Meson de Pepes, near Mallory Square. 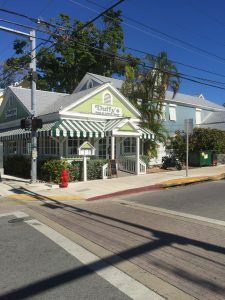 BTW, roosters are ubiquitous in Key West. 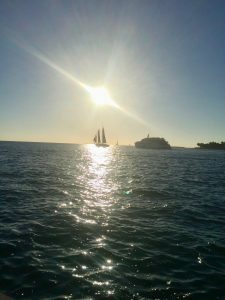 After dinner, we joined in the ritual of watching the sun go down at Mallory Square. 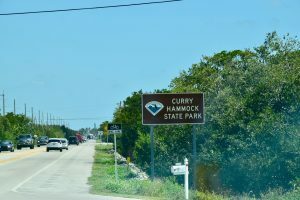 The next day, we were finally able to reach our destination – Curry Hammock State Park, near Marathon, Florida. 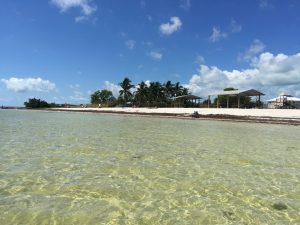 Snorkeling and kayaking were popular activities at Curry Hammock, with sparkling crystal clear waters. This was the view of the Atlantic Ocean from our campsite (#19). 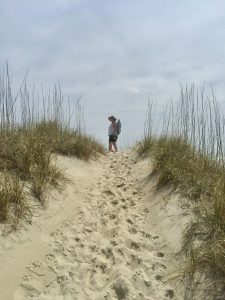 A short path lead from the campground to the beach. Betty & I had this portion of beach to ourselves during our visit. We spent the day in our chairs, sitting in the bathtub warm water. BTW, there is no wave action along this portion of the Atlantic coast. Our quiet, soul-restoring day at the beach ended with another amazing sunset, watched from our perches in the Atlantic Ocean. 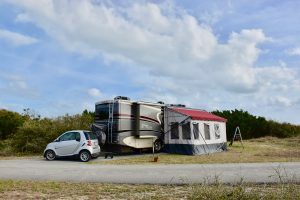 After our funtastic visit to the Florida Keys, we returned to our Long Pine Key campsite in the Everglades National Park. 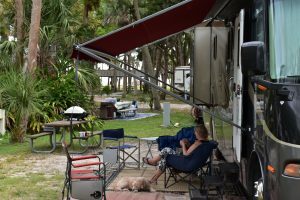 Our current site (#3) in Long Pine Key campground. Nice sites are unserviced, which is fine with us, but largely unoccupied. 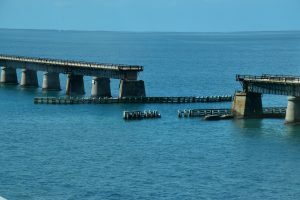 The abandoned Flagler railway, built over a century ago to link the Keys, is now used for fishing, with breaks to allow ships to pass. The temp. 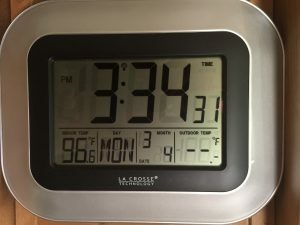 today was 96.6 f. in our motorhome. That is after I started the a/c, which often runs all night to keep us comfortable. temperatures in the high 80’s f. every day (while the weather back in Winnipeg was well below freezing) was wishful thinking. 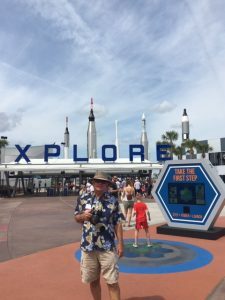 Betty & I hope that all who wistfully read this might have an opportunity to do their own wishful thinking and enjoy this funtastic sunny tiny tip of Florida some day! Note: for some reason, some of our best pics (taken in portrait) will not rotate & load. If I figure it out, this post will be updated. We also ate the Key Lime Pie too fast to get pictures, so you’ll just have to use your imagination. lol G.R. 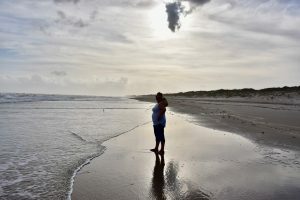 Verva & Mike on Whatever Happened To Galveston Island?